We all know “The Twelve Days of Christmas.” It’s the world’s longest Christmas song, the subject of the yearly Christmas cost index, and has spawned probably dozens of variations. A Rare Nativity, though, is different than any other variation of The Twelve Days that I have ever seen. Not only is it incredibly creative, both visually and in verse, but it gives us so much more to think about than Lords-a-leaping and swans-a-swimming. 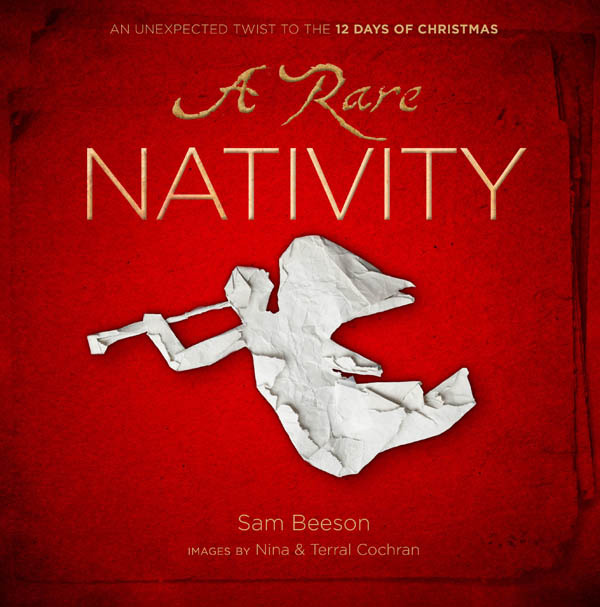 The creative writing skills of Sam Beeson combine with the photographic talents of Nina and Terral Cochran to create an unforgettable twist on this Christmas classic. The Cochrans use photographs of trash combined with Sam Beeson’s tale of revenge against an enemy to illustrate the twelve days of Christmas. But it is what the enemy does with that trash as he seeks forgiveness that really makes this tale. As we see the enemy’s plea for forgiveness and then view the creative reassembling of the trash into a unique yet traditional Nativity crèche that changes the meaning of this song and completely changes the paradigm of spending and gift-giving during the holidays. Beeson’s words invite us to grant open-hearted forgiveness as the greatest gift we can offer during Christmas. This book will take an honored place among my Christmas books this year. We will be reading it together as part of our family Christmas preparations and talking about not only the creativity and uniqueness of the story, but also its message of forgiveness and the most important gifts of Christmas. A Rare Nativity is available in beautiful hardcover from Amazon. And there’s still time to get it before Christmas.